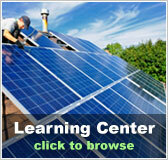 Selecting a solar water heater | Solar Panels | Solar Power | Site Map | Bookmark This Site! If you've looked around the island, you may notice that solar water heaters are landing on roofs everywhere. 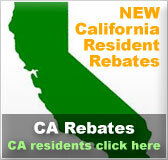 The water heaters pay for themselves in saved electricity in a matter of months. If you use hot water, they are definitely worth buying. There are two basic styles from which to choose. 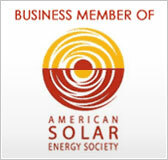 There are a few things that a solar water heater has to do. The water has to get heated by the sun; the hot water needs to be stored somewhere; and you need to get that hot water from where it is being stored to where you need it, either with a pump or by gravity. Finally, it is nice if there is some sort of back-up system to heat the water in case there is no sun for a few days or in case all the stored hot water gets used up at night. Let's first discuss the kind that you'll see on roofs that looks simply like a panel of tubes. This type of solar water heater doesn't have a tank built into it. It's "tankless." You install this type of solar water heater between your existing pump and your existing electric water heater. 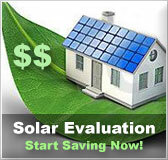 The water is heated on your roof by the sun, and then is stored in your existing water heater. You can think of this as "preheating" the water for your electric tank. You can then turn off your electric water heater and let it serve simply as a storage tank. In this case, you'll want to make sure that your tank is well insulated. The better insulated it is, the longer it can keep that water hot. In situations when the sun is not out for a few days, you simply turn on your electric water heater and this serves as your backup mechanism to heat water. The water comes into the house pressurized from your existing pump, just as it was when you didn't have the solar heating panels. The second type of water heater has the storage tank attached to it, sitting above the heating tubes up there on your roof. You pump the water to the solar panel, which heats up the water and stores it in the attached tank. The water stays very hot in these types of solar heaters, because it circulates from the storage tank into the heating tubes, constantly re-heating the water. Many people report that the water actually boils. The water then flows into the house, bypassing your current electric water heater. The water is not pressurized. It just flows in by the force of gravity. Some people mentioned to me that the water pressure can be low with this type of water heater, so if you want pressurized water, you'll have to install a second pump to force the hot water into the house. This isn't necessarily a problem, except that most pumps wear out faster when hot water is flowing through them. Many of these solar heaters do come with a backup electric heating element inside the tank to heat up the water when the sun is not available. Both types work well, and we have been happy with our tank-less solar heater since we installed it a week ago. We've only had to turn on the electric heater once for about an hour. (Our four kids took baths at night and used up all the stored hot water, so there was none in the morning.) We've significantly cut our power usage, and decreased our carbon output. There are a few solar water heating dealers on the island. It's a great investment.